If there was ever a week to remind me of why I first started seeking out self care in the kitchen, it was last week. I spent the better part of the week staring at my computer screen editing a grant with a lot of medical terms that are not in my usual vocabulary, so my eyes were starting to glaze over. Thankfully it’s now submitted, but I also didn’t let it hold me back from making delicious meals when I came home each night. 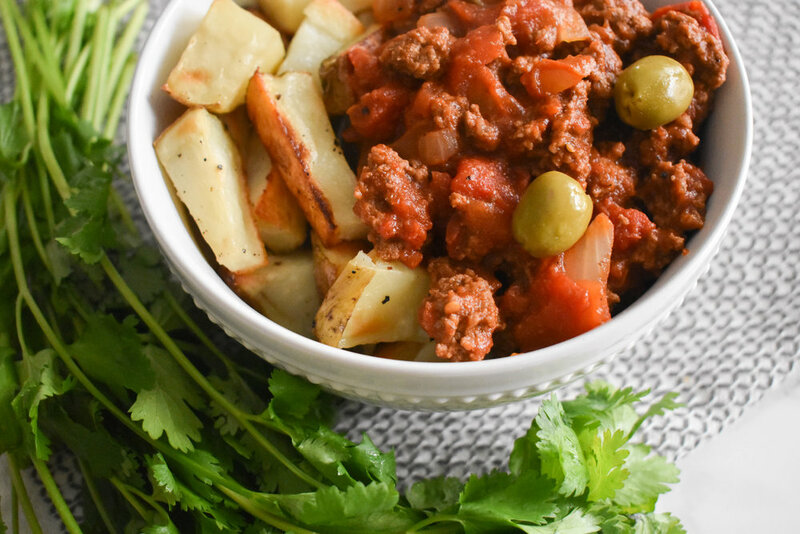 One of those delicious meals was this picadillo. I first created this recipe about two years ago and it has been a household favorite since. Andy is a HUGE fan (most likely because I add green olives in it just for him) so it is on a heavy rotation. It doesn’t take long to cook, and never disappoints since it is full of flavor and easy to throw together. This was our first time trying it served over potatoes since we’re on Whole30, and it was just as tasty as our usual rice base. Give it a try for yourself and enjoy this Cuban classic. In a skillet over medium-high heat, saute the onion and garlic until the onion has softened, about 5 minutes. Add the ground beef to the skillet and cook until no longer pink. Add the remaining ingredients to the skillet, stirring to fully combine. Place the lid on your skillet and place on low heat and allow to simmer for 15 minutes or until the picadillo thickens. Serve over rice, riced cauliflower, or potatoes.